And work, and God knows why. And what’s to show for all my pain? And all’s to do again. 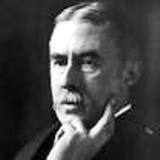 Alfred Edward Housman (1859 – 1936) was an English poet best known for a collective work called A Shropshire Lad, which has remained consistently in print since first published in 1896. A renowned scholar of the classics, Alfred was, for many years, a professor of Latin at Trinity College in Cambridge, where he had a reputation for terrorizing his students and never bothering to learn their names. Widely known and admired even now, Alfred’s work is referenced in, and excerpted from, everything from movies to comic books. Wonderful sense of humor. Capsulizes the never-ending struggle with housework, but, written by a man of his age, undoubtedly refers to other tedious recurring jobs. What a treat to encounter the work of masters! Simple, musical, delightful, true. Wonderful poem. What am I doing up? But, of course, I am.